At Le Cache, we not only strive to create stunning, reliable refrigerated wine cabinets, but also to provide world-class service and support to all our customers. Our company's owners prioritize straightforward pricing, excellent customer service, and the best warranty in the business as important aspects of our guiding principles. Discover some of the benefits—beyond the craftsmanship and technology of our cabinets—that we're committed to providing for customers. We back our wine cabinets with 5 years of coverage on the cooling system and 2 years on the cabinet. Our warranty covers both parts and labor. If your cooling system stops working and needs a repair, the first thing we'll do is send you a replacement cooling system. You won't need to remove your cooling unit from your cabinet until you receive the replacement unit. That way, your wine collection won't go unprotected during the repair process. Under our standard warranty, your only cost will be the freight to ship the cooling system to and from Le Cache's headquarters and the time required to swap the cooling units. Le Cache also offers an enhanced warranty, which extends the warranty coverage on the cabinet from 2 years to 5 years. In the event the cabinet or cooling unit needs repair, we'll pay for all shipping costs not covered by our standard warranty. In addition, the enhanced warranty provides in-home service to swap cooling units, in case yours needs to be exchanged. When you call in to ask questions, you'll talk to a Le Cache employee with extensive knowledge of our products—not an anonymous rep at a remote call center. Located in Petaluma, California and Dallas, Texas, our customer service team is happy to help you pick out the right unit to suit your collection goals and lifestyle. We're also here to troubleshoot any issues you encounter with your cabinet or cooling unit. You can reach us by phone or live chat online. Our cabinets are available for immediate delivery. We generally ship cabinets within a speedy 3 to 5 business days of receiving an order, unless the item is out of stock. Once shipped, a wine cabinet usually takes 2 to 3 weeks to be delivered. Inside delivery to the ground floor of your desired location. Set-up of your wine cabinet. If necessary, cabinets can be delivered up or down one or more flights of stairs for an additional charge. 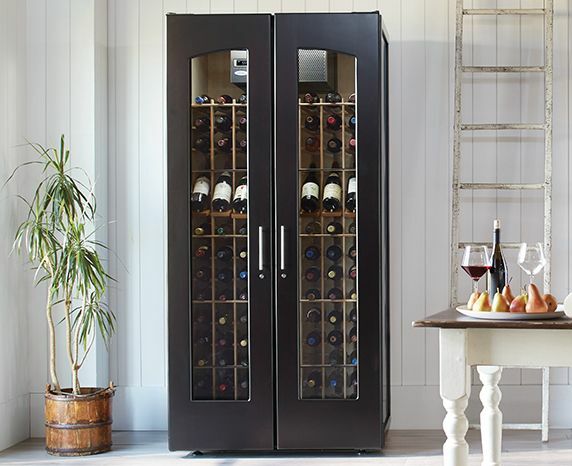 By contrast, many competing wine cabinet manufacturers estimate that it will take as many as 10 weeks to ship a wine cabinet, plus another 2 to 3 weeks to deliver your wine cabinet. Click on the "estimate shipping" button. If you prefer, feel free to give us a call toll-free at 1.877.532.2243, and we'll be glad to calculate shipping for you. Read more about Le Cache's shipping policy. Our wine cabinet prices as advertised include everything but shipping (and taxes for California residents). Digital display and temperature control. Choice of top or rear air intake. Compare our pricing to other manufacturers, who advertise a base price and then charge extra for premium factory wood finishes, glass doors, universal wood racking, top-vent exhaust and other features that are included as standard with Le Cache wine cabinets. In other words, you may end up paying much more than you expected for a competing brand cabinet. So, how is Le Cache able to offer high-quality products at such reasonable prices? We can pass such strong values on to you for 3 reasons. 2. We increased our inventory turns by decreasing lead times, resulting in savings to working capital. 3. We limit the profit margins on our wine cabinets well below the profit margins made by higher-priced competitive products. It's important to us to be able to offer fine furniture at affordable prices. Think of our cabinets as attainable luxury! 4. We moved the manufacture of our cabinetry overseas, while maintaining production of our cooling units in Petaluma, California. Compare our pricing versus other manufacturers, using our handy brand differences charts. Read more about our philosophy and customer service commitment. We'll be glad to talk to you toll-free at 1.877.532.2243 or you can chat with one of our expert representatives online. You can also use our contact form.